Hoopla’ is the cosy and comfortable bouncher chair, that embraces your child. Comfort and growth. The Hooplà bouncher chair is equipped with a ..
Chicco Mode: comfort out of home! 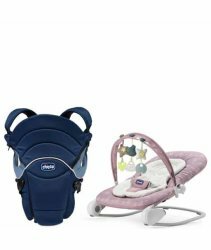 The Chicco Mode Booster Seat is the ideal solution for toddlers who want to sit at the table and join in with their family during m..
Soft&Dream, the baby carrier with 3 carrying positions. Soft & Dream baby carrier follows the growth of your child in every season, while ensuring maximum comfort. It off..
Make your outings magical in the premium UltraSoft Magic 2-way infant carrier! This premium upholstered 2-way infant carrier allows baby to face in for soothing sleep, or out to explore the..
Ergonomic shape Exclusive ergonomic shape that provides a snug and secure fit for every mum. Special fiber filling The special padding is soft and compa..
Hoopla’ is the cosy and comfortable bouncher chair, that embraces your child. Comfort and growth. The Hooplà bouncher chair is equipped with a modular reducer ..
Amazing and extremely comfortable You & Me Physio comfort baby carrier that promises great style with maximum comfort for your baby at all times. This is designed to give you great ..